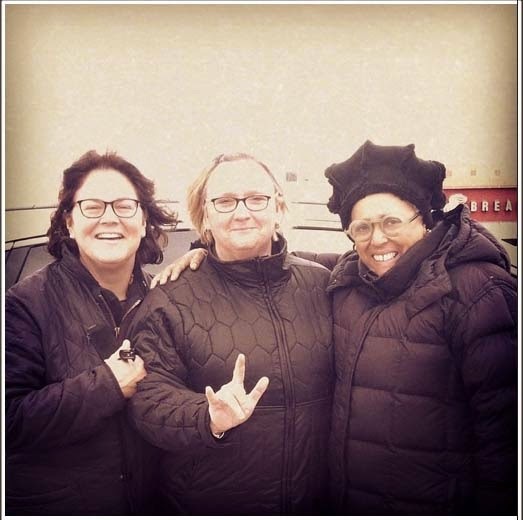 A few weeks ago, my friends Alice, Cathy and Cynthia met up in the center of the state for lunch - halfway for all of us in Leominster (pronounced Lemonster if you live in Massachusetts). It was just what I needed after this really long winter. These friends are kindred creative spirits and when we get together we always share what we are making, gossip about industry and crafting news, and how things are generally going in our lives. It was sort of like an old-fashioned sewing circle without the sewing because we were tucked into the corner of a busy Panera Restaurant and I doubt they would have liked it if we stayed longer than we did. After lunch, we discovered a huge Jo-Ann's Fabric Store. I'm not a fan of chains but now with the loss of so many indie fabric stores, this chain is one of the last catering to the home sewer and crafter. The one we visited was stocked with all kinds a fantastic products. Seriously, I have never been in a nicer Jo-Ann's. It had an incredible selection of quilting fabrics, all kinds of tools for sewing, embroidery, quilting, scrapbooking supplies, cake decorating, books. The lighting was good and the staff friendly and helpful. At lunch, there were some knitting projects shared and Cynthia knit while we chatted. She was having a bit of a problem with instructions she didn't understand and Alice had the answer. Alice had on a beautiful guernsey sweater from an old Rowan mag. Cathy smuggled in some of her outrageous homemade brownies that we ate after lunch. 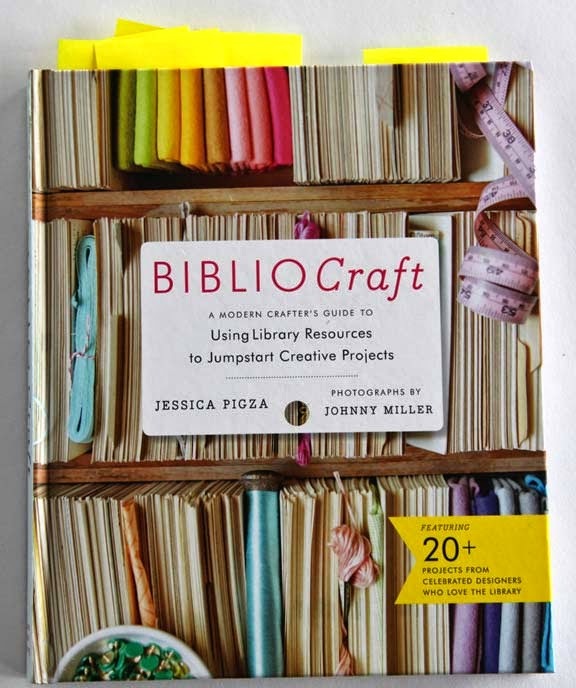 I brought a few review copies of some new books, including the one I am writing about today - Bibliocraft by Jessica Pigza. It is fun when you get to dish with friends about a new book. Of the three books I had with me, this was by far the favorite of all my friends. Here is why - it is extremely useful if you are a designer or crafter making things and being inspired by things of the past. The author Jessica Pigza is a Rare Book Librarian who works at the NY Public Library. Can you imagine that job? Really - to be close to the collections of some of the most amazing things in the world in one of the biggest cities in the world. Seriously - this girl is lucky. What we all liked about this book is that it had what I call "meat" or maybe you might call substance. In the beginning of Bibliocraft, she explains things about libraries that I didn't know existed. From the library system (branch, research, special collections), to how to find the right library for you (mindblowing info here), to how to plan a library visit (yes - there is a proper way), to how to search. Bibliocraft explains things that I think only librarians know and she does it in a way normal people can understand. Jessica introduces Digital Libraries (with all kinds of links to stumble down that rabbit hole of endless information on the web). 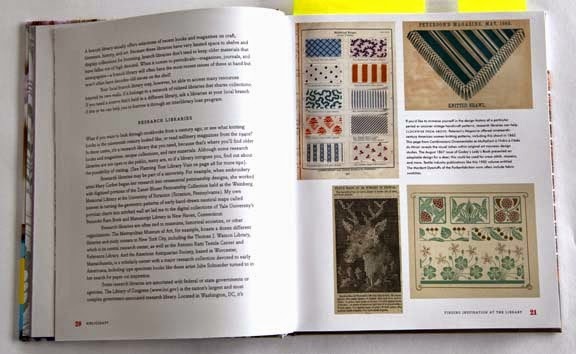 Then there is the chapter on Library Collections - this information for an artist, crafter, and maker is pretty amazing. 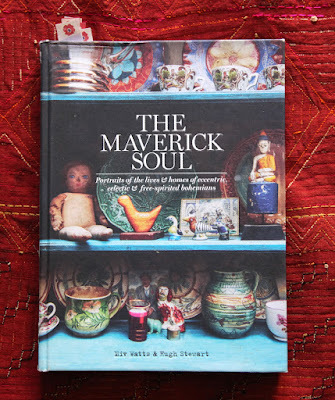 It is a listing of sources of collections of books - where to go to find inspirational things from craft, home economics, book arts, costume, children's books and more - a lot more. There is a section on Copyright and what is right and what is wrong to do. There are a lot of people who should read this! She tells her reader what is acceptable and what is not to take and use. 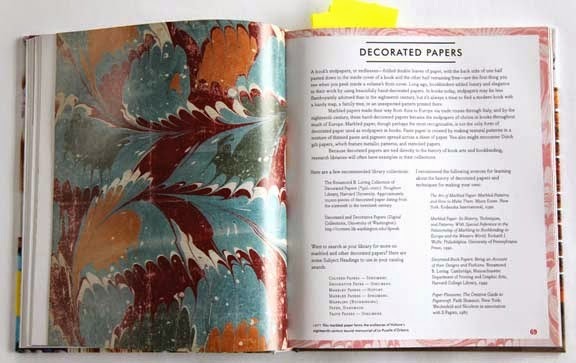 After all this incredibly useful information, there are 20 projects that are designed by "in" crafters, authors, and names in design including but not limited to Jodi Kahn, Mary Corbet , Anna Bondoc, Haley Pierson-Cox, Heather Ross, Natalie Chanin, Grace Bonney, Liesl Gibson, Rebecca Ringquist and more - many are STC authors which should be no surprise since STC/Melanie Falick Crafts published the book. Here is a giant cross-stitch on pegboard by Hailey Pierson-Cox inspired by Illuminated Manuscripts. inspired by these beautiful graphics - what we might now call "logos." 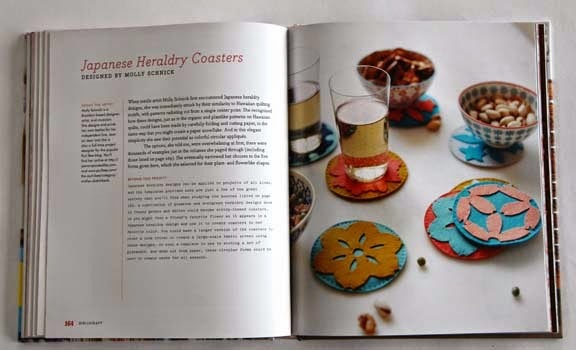 Bibliocraft isn't your normal craft book because it is so jam full of useful information. Sure you could find it on the web but this is all in one spot that you can keep on your bookshelf for reference. Maybe if you are a librarian you know all this - and I know there are some of you who are! But if you are like me - this is a very helpful book. If you are a knitter or crocheter, you probably wouldn't look at this book if you heard about it - there are no knit or crochet projects in it. 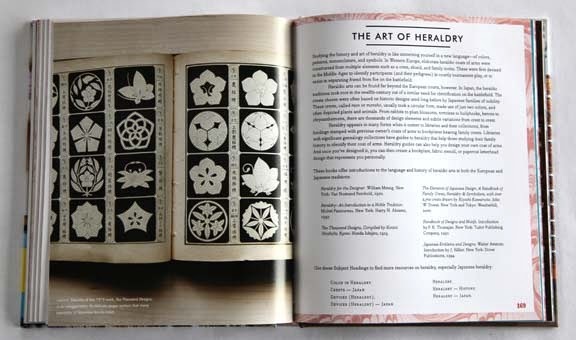 But if you are into other art and crafts and like to dabble in all kinds of projects, this book will be very useful. Tomorrow I will share with you a project I made inspired by Bibliocraft. For today, I've got a giveaway for one lucky reader. Tell me your favorite library or book story. It can be something that happened to you at a library, someone you met at a library or book store who changed your life or a book that means something special to you. Can't wait to hear your stories because I always learn something new about my readers through these giveaways. Thanks for entering and reading. Contest ends Monday April 21st (Boston Marathon Day!) at 11:59 p.m. As always, please leave an easy way to get a hold of you - email, Rav id, Blogger id. US addresses only! I have many happy library memories, but here's one of my favorites. When my children were young, we lived in Williamstown, MA and went frequently to the town library. Our family, unusual because we have six children, was well known to all the librarians. We were regulars at story hour and we routinely walked out of the library with tote bags FULL! Every year, just after Thanksgiving, the library staff would put out the Christmas books and I would make a beeline to the "T's" where I would check out Becky's Christmas by Tasha Tudor. It is one of my all-time favorite books and was one we read again and again, year after year. (I now own a used copy which my sweet husband bought for me several years ago - it's a treasure). Anyway, fast forward to this Christmas ... we no longer live in MA but received a card this year from friends with young children, who still frequent the Williamstown library. It said, "I just checked out Becky's Christmas from the library ... I'm very glad for the computerized library system, but also smile to see that [your family] checked out that book every year from 1994-1998!" (the library left the old cards and pockets in the back of the books). I just love that little bit of family history and the continuity of loving a book and sharing it with friends, even across the years and miles. It's the library that made that possible! Great book giveaway! Thanks, as always. I love my local library. The staff are friendly and helpful. I had only lived here a few months when I walked in one day to pick up the book I had on hold. I wandered a bit to look for something else, then came up to the circulation desk. I told Dorothy that I had a book on hold. She said, yes she knew and had gotten it off the hold shelf for me because she saw me come in. Now that is service with a heart. The library has been my one starting point for getting to quickly know a new town. We moved a lot, every year or two. Which meant that my personal library was culled frequently. I always headed straight to the 700s (crafts and design) and the garden sections to see where the local interests focused. And of course, to learn something new. Even today, the library is on my checklist when visiting. I love the old village Carnegie libraries and the sparkling newer architectural metropolitan libraries. Thanks for bringing back fond memories. My Kindergarten teacher was a librarian, very tiny town in Southern Missouri and she would pick us up, wouldn't happen today! but she would be the bus driver and then the teacher. Our "classroom" was the children's section of a wonderful old public library building. I think this was the beginning of my life-long love of libraries. They are still one of my favorite spots. My favorite books as a child were the Wizard of Oz series. One year after we watched the movie on TV my father gave me the first book to read (I'd had no idea there even was a book), and when I devoured it I got the second, and the third, and pretty soon had finished all 30-plus in the series. I lived in that magical world for months. The books were my dad's when he was a kid, and the love of reading is a huge part of my family heritage. My mom was an elementary school librarian, so we spent a lot of time at the public library, where the school board library department was housed. One day, when I had accompanied her to the library, we ran into a teacher-friend of hers who happened to have a horse. Now, she knew I was horse-crazy, (I'd been asking for a horse since I was 3), and invited me to come out to "the barn" where her horse was boarded, ANY TIME, to visit and ride. On the day Mom took me out there, there JUST happened to be a very nice horse for sale and I got SO excited! My hopes were soaring, even though Mom warned me that my chances were slim. That night, when my dad got home from work, I pleaded my case while my mom sat quietly waiting to console me when my dad said no. Well, he said YES!!! My mom jumped up in surprise and protest, but before she could say a word I ran to the phone to call the owners of the horse to tell them that yes, yes I COULD buy Princess, the Arabian mare. She was my first of two horses I owned in my school years, and it all came about because of that chance meeting at the public library. One of my favorite books is Everyday Sacred by Sue Bender. It helped me look at my life differently, seeing every moment as a possibility for spiritual practice. I also use it as an excuse to buy inexpensive flowers to brighten up my house! Oh, I am such a library girl. My hometown library had a 'mean' librarian who expected kids to behave and be quiet in the library. I used to bring my developmentally disabled younger brother with me somtimes, and check out books for him. One day she asked if he could sign his own name, the requirement for having your own library card in those days. He could, and she insisted then and there he needed his OWN card. He was so proud. She also saved books that were about to be discarded if they were a topic she knew he liked, like airplanes and dinosaurs. I will never forget her kindness. Mrs. Renwick, I still think of you. Up through high school I was at the town library constantly - it fostered my love of mysteries as well as allowed me to sample lots of 60s rock - even artists that were fairly not mainstream (Iggy Pop). 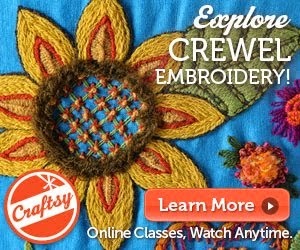 Your description of this book has intrigued me, even though I am mostly a spinner, knitter, crocheter, I do want to get back into sewing. When I was a kid, our library (which was very small), had a fireplace with a bearskin rug in front of it. Some of my favorite memories are of lying on the rug and reading. I would pet his nose and ears. I think every other child did too and we wore the fur off of his ears. When my kids were little, we lived in a small town with no real 'center'--except a small park and the library. As my boys became more independent in their play, I would let them do their own thing while staying in the same room. This didn't lead to lots of cleaning, and I wasn't yet a knitter. That left books! I was constantly on waiting lists for books that I wanted to read, and made multiple trips in to pick books up every week. They got to know me so well that when they saw me walk in my books would already be pulled from the shelf and waiting for me. Occasionally, they would have finished the check out process by the time I reached the counter! When we moved, our new library was much bigger and less personal. I still miss that little town! My first job out of college was within walking distance of the main Seattle library. Part of my job was as a messenger, and I could take my break zipping in to find new books to read. Libraries have always been like home to me. When I was growing up, there was an old library within walking distance of my mother's office, and I went there to visit the sweet librarian, Miss Kate, and check out books while waiting for my mother. Later, as my husband, children and I moved from town to town, one of the first things we did was to find our local library and get library cards! But now, one of the best things is that I have become an active member of the Friends of the Library in my home suburb in South Carolina. It's a joy! We meet monthly 8 months of the year, and two to three times a year we hold used book sales. I just love getting to be a bookseller on book sale days, helping children and adults find the perfect book for them. I have good friends in the group too, and we have a great time working together. Our little group raises thousands of dollars for the library branch yearly, so that they can pay for special programs and extra things the county budget can't provide. Thank you for this chance to tell you how special libraries are to me. No matter where I travel to, I always scout out the local library. They are the familiar in an unfamiliar place. My co-workers can't believe I'd bother to find a library while on vacation, but exploring the differences while enjoying the familiar is my idea of fun. I can't even think of one story. The library has been an integral part of my life as long as I can remember. I grew up in a small village and the library was the center of life. It was located across the street from a stately row of churches. The library was special because while I might go to the Presbyterian and my best friend to the Catholic we ALL went to the library. I remember one magical summer when they offered a puppetry class. It was the perfect thing for a crafy, bookish girl. We read stories then created puppets, banners and scenery. Heaven! I am retired after over 40 years of working in libraries in Massachusetts and luckily live close enough to have gotten to know Kristin and Mark, "the farmer". It is heartening to read the stories about what libraries have meant to everyone leaving comments here, and how Kristin and friends really enjoyed Bibliocraft and its hints about navigating libraries,finding what you want/need and learning all the kinds of information libraries now offer. Many have predicted the demise of libraries due to the Internet, but actually libraries are busier than ever according to the American Library Association. So thank you Kristin for bringing libraries to the farm and your blog!!! If there is such a thing, I think I might have "BIBLIO-BLOOD" or perhaps, a "BIBLIO-GENE"..? -- One of my Father's maternal Aunts used to work at THE BRITISH LIBRARY [she even wrote a few books on libraries]. Then one of Dad's first jobs when he came to Canada was at the PARLIAMENT LIBRARY. As for me, I've had a fascination with books since I was a toddler. Although, perhaps a bit on the "destructive"-side... I remember that I used to enjoy carefully peeling off the pages of paperback books, then neatly stacking the sheets and securing them with elastic bands... Weird, I know. But, I suppose that it was my "cleric"-ness coming out. Anyhoo, I began actually *working* in my grade-school library when I was 10. And later, in my high-school one. Meanwhile, I was amassing my own rather large collection of various tomes... Eventually, I ended up working for what was the Country's largest technical/science library for the next 27 years as a library-technician[clerk] - and, getting to tell Nobel-Prize-Winning-Scientists "where to *discover* themselves"! -- yes. I have actually worked with "Rocket Scientists"! However, although I've been "retired" for almost a decade, *MY*-LIBRARY still grows... Yard Sale FINDS have been a goldmine-resource of "Table-Top" Reference books! - As convenient as DIGITAL information is, there is still NO comparison to actually *holding* a Hardcopy IN your hands! - So, when a once $50.+ book goes for a Dollar, just watch me start STACKING! 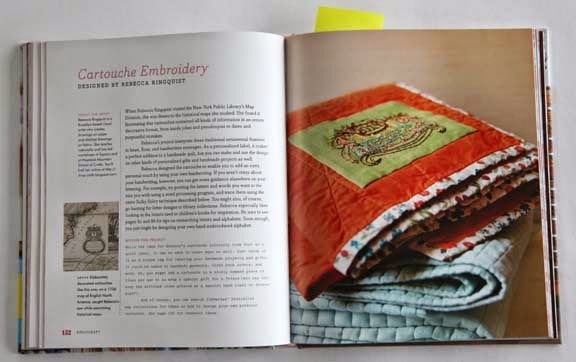 BTW, between my Mother and I, we probably have enough Needle-art and Crafting books to open up a Library! - But MORE are always welcomed! - Now, I just have to LIVE to 120 to get around to finding the time to "flipping" through my Collection!! I am the mother of quadruplets - three girls and one boy. They are 25 years old now. However, when they were little I used to take them to bookstores all the time. Libraries didn't work for us because of the whole quiet thing. Book stores were perfect. We would go to Barnes and Noble, spend time choosing books and music, go to the cafe for a snack, (I loved their chai tea!) then head home listening to our new CD in the van. When we arrived at home we would get cozy in our living room and devour our new purchases. We also had our favorite independent bookstore. There, the owner Sally, would chat with each of my children then suggest a book she thought they would love. She was always right on. All four of my children still love to read, and we still love to visit bookstores! I am grateful that bookstores were readily available when my children were growing up. Libraries have been part of my knitting since I took my first class in Seattle in the early '90s. After three classes we were still learning how to cast on, and the knit and pearl stitches. Bored, I went to the library and discovered Elizabeth Zimmermann--a fortunate find, although not surprising because there really weren't that many knitting books anywhere! So, anyway, 6 years ago I was feeling broke and promised myself I would not buy any new hardback books. I was at the Hadley MA Barnes and Noble and I found this gorgeous color knitting book, by Kristin Nicholas! Using my new smart phone (a gift) I found it at the Northampton library and put it on hold. Whew! I LOVE libraries! Sadly, or perhaps not, the book was so lovely and to my taste, that within 2 months I bought myself a copy, and another for a friend. One of my wonderful memories of books is when in the first grade I had a teacher whose name was Mrs. Whitebread. She would take time out of the day to read to us. She read Anne of Green Gables books and Laura Ingalls books. As a child I sensed how much she cared about her students and wanted to pass on that love of reading. I am 52 now so that was quite awhile ago. The memory of her has stuck with me. My brother and I lived with our grandparents in a small town in Minn. when we were in grade school. The Carnegie library was at the end of the block. I was misdiagnosed with rheumatic fever when I was 8 and spent spring through fall of that year on bed-rest. My grandmother would bring shopping bags of books home. My cat and I happily read through the seasons. Turned out I had a heart murmur I grew out of and a love for books that I didn't. I enjoyed reading every single comment. I too grew up loving libraries. I was born in England and, as a child, I was an inveterate reader. We used to lug the maximum number of loanable books home each week for me. I was often ill with bronchitis and my Mother would would. Are the trek to bring me seven at a time - not easy when you. Have to take a bus and walk a distance. I'd left one book 'till last, as it just didn't seem appealing...finally I was desperate enough to read it...and discovered one of my all time favorite's "The Secret Garden". One of the most difficult aspects of emigrating to the US was having to get rid of so many of my books, all favored friends. Hi Kristin, I was an only child, shy, not many close friends. When I was in 2nd grade, a friend who lived behind me asked if I'd like to go to the library with her. My mom let me go with Karen and her mom to the local branch. They had a car so I'm sure we drove. Karen helped me get my first library card and select some books I could read. That afternoon a whole new world opened up to me. I have a lifelong reader ever since. Many times my mom and I would walk the half hour it took to get there, we had no car. Once I was old enough I would use my school bus pass to take myself. I will always be grateful to Karen who opened up the world to me. I stumbled upon this post and enjoyed reading it. Now I am curious about the book you reviewed and will look for it. Growing up in the mountains of western Washington during the 40s and 50s, my first library came on wheels - the BOOKMOBILE! What a magical kingdom it presented when it pulled off to the side of the road near our farm. When a corner of our school lunchroom room was partitioned off with shelves full of books it allowed more access but lost a definite appeal. Books and crafting (along with other "vices") still hold me in their grip. Imagine now being able to access my local library via my computer and ordering any book of choice!! I don't know what I would do without the library. I love the way I can reserve things on line now, but also I wander through to look at the shelves, almost every week. The women at the circulation desk know me and have my reserved book ready when I check out. I still remember the smell and look of the Little House on the Prairie series from almost 60 years ago. My daughter spent many, many hours in the library. She is now a librarian. I have many fond library memories - starting as a child visiting our local public library in the Bronx! Years later, as a young art educator, I couldn't afford all the beautiful art history and technique books that called my name from our local bookstore - so back to the library I went and rediscovered the glorious '700' section (Dewey Decimal) in depth once again! The hours spent in the racks pouring over art history facts and visual images contributed to the depth of my art-knowledge imparted to adolescents at the beginning of a long teaching career! About 15 years later, and earning sufficient money to start my own art library for my students, I met and married a Brit whose mid-life crisis led him to the states and change in career path. He became a research librarian at the college level, and obtained a position at a small arts/humanities college in the NY metropolitan area. With his position came my re-acquaintance to the treasures of an academic library (using Library of Congress classification) technology, and data bases. When visiting, I set up in my little corner near the window, surrounded in the delights of design and dada, and drift into my own creative world armed with sketchbook and laptop...and plan on all the creative journeys yet to come in my new found retirement! I taught young children in both preschool and Kindergarten for my teaching career. During that time I set up a children's library with many many donated books. The books were color coded on the spines by topics. That made it easy for young children to navigate the Library by themselves. When I became Director before retirement I always found time to do story time with small,groups in the a Library, then help them choose a book to enjoy in their classrooms. Upon retirement , the new Director had the Library dedicated to me with a brass plaque on the door. I was very honored. I was born a logophile and raised a bibliophile. In other words, I love words. I love libraries. I love bookstores. I even dream about bookstores. I love words, whether mellifluous, rough, or plain, blunt or flowing, assertive or discreet. I love them when the sound matches the meaning and perhaps more when it doesn't. (How can pulchritude mean beauty?) I loved the collective rhymes, rhythms, and meter of words, and their synonmyms, antonyms, homonyms. I love words' roles: nouns, verbs, adverbs, etc. Words are delicious -a smorgasbord bounty for communication. My library story -a new insight about words: I worked at Hartford Public Library in Connecticut while I was a college student. Talk about bounty! The world's best words surrounded me. Heaven! Haven! It was there that I found a tiny book that stole my heart. Letters to a Young Poet. by Rainer Maria Rilke. I devoured it, practically memorized it. Two years later, I decided I needed my own copy. I bought one and...was...very disappointed. Had I changed so much that those words I had loved didn't "work" for me anymore? How could it now seem flat, ungainly, unbeautiful? Can you imagine what I learned when I looked at my old beloved copy at the library again? Translations matter. I was, in the parlance of 1969, blown away by the discovery that I had first read a beautiful translation and had subsequently purchased disenchantment. This idea. What an idea! Translations cannot be word-for-word translations, exactly because we have so many synonmys, precisely because of culture and idiom, and the nuances within and between languages, and more. And it is even more complex when translating poetry and other creative writings. The translator must be an artist, too, in order to bring the author to the reader. And so a new idea and an abiding fascination was added to me, the young logophile. One last word. I am 66 years old and I just found the word logophile today. That's because of your blog, Kristin. Thank you. A new word is a gift. Delicious. I found To Kill A Mockingbird early in my high school years. When it was assigned reading-I had already read it twice. It was and is my favorite book. I feel it shaped me in my worldview and my loves- 6 kids and husband of 32 years. My husband is a man of great integrity and my kids gave grown into adults that live out the ideals portrayed in the book. My first grandson is named Atticus. :) And my grown children are living lives of grace and acceptance of people around them. I have fond memories of visiting the library with my pre-school daughter who had quite an appetite for books and still does. She would stride into the children's section, with arms swinging and a big smile and announce, "I'm here!!!!" in a sing-song voice. The librarians always greeted her warmly and brought her to the desk where they had set aside some books that she thought she would like. Her favorite was "The Stupids Step Out". She bought the book for her own children. What a very cool book! The first "big" trip we were allowed to take alone on our bikes was to the local library (all of a mile away) and I'd check out the limit and pedal back home to read them all as fast I could. Worked my way out of the children's section by the time I was nine, I think. One of my fondest memories of the library is listening to Dylan Thomas' "A Childs Christmas in Wales". Our library had a great listening library,turntables, headphones, little cubbies, you could get totally lost in your own world. I love libraries and bookstores; however, my favorite reading memory will always be of my 10th grade English class and "The Bishop's Candlesticks." I told my mother about this great short story from my class. When I mentioned Jean Valjean, she knew I spoke of Les Miserables. The next day she purchased Hugo's novel for me. She handed it to me and said here is your bishop's candlesticks; I think I did a double take and probably gulped a couple of times, but I did read the entire novel and loved it. It will always be my fondest book/reading memory and a special remembrance of my very special Mother. Books and libraries are among my earliest and fondest memories. If it isn't moving I read it. I worked in the campus library in college and walking into a library or book store today makes my heart beat faster. I am very proud of the fact that both of my children are avid readers and hope to help future grandbabies love libraries and books as well. I grew up in a book loving family. My mother would go to the library every week and fill her wagon with books.My first job was as a library page, and my mother became a librarian when her children were raised. Now I mostly listen to audio books while I work (I do sewing). As a teenager, I read things like Dickens, which I enjoy much more now. I absolutely love my libraries. I can go and read a book or better yet get a book on audio and knit the day away! It is hard to pick a favorite library story as I am a librarian and work in a library almost every day. So I'll just pick a recent story. I work in a college library and at the end of every semester, we have a finals study break for the students. This year, we added a stress relief table for the whole week of finals. The table was stocked with play dough, coloring pages, markers, origami supplies, and more. Every morning I looked forward to seeing what they had created the night before. 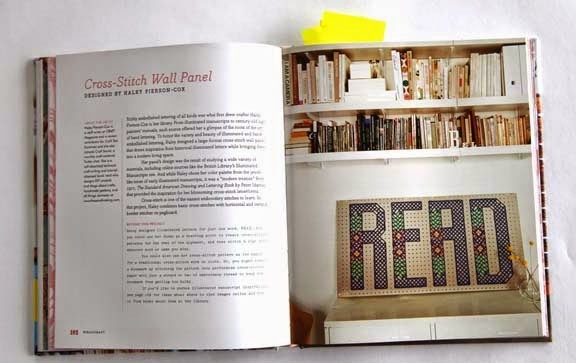 I'd love to add some true library-themed crafts to the table this year - this book might be just the thing! I have always loved to read! When I first learned to read I would go to our local library, which was within walking distance. every chance I got. I would go and find a book and just sit down on the floor and start reading. When it was time to leave I was always so sad but would take books home and read there too. Because of physical issues I couldn't play like other kids and so books, and the library, became my best friends. When I was little we lived in Anaheim California. It was the 1960s Anaheim when it smelled of orange groves and honeysuckle blossoms. Our mother had not yet learned to drive so the borders of our world were defined by Wilken Way and South Haster Street. One day, a Book Mobile parked on our block. My mother helped all five of us inside where we each of filled out a library card. I coarsely and quickly scrawled my name in pencil across the line the card provided, then checked out my first book: Black Beauty. We waited each month for the bookmobile to return eager to explore its wooden racks for new books of every kind. My favorite memory was sitting Indian style pulling books off the shelf surrounded by library smell. As a little girl we went to the library every Wednesday. We could only borrow 3 books at a time otherwise my Mom lost track and Tuesdays were a hunt for the books. As an adult, library's are my go to for audio books, how to books, and pleasure reading. The librarians are my go to people- often I only have a fragment of a title or subject and they are able to connect the dots. Librarians are a towns hidden treasures! Thank you for the great book review. A favorite library story is when I was six years old & went with my Mother to the South Londonderry Library with her, in Vermont. A special treat that it was just me, without my brother or sister. The library is still the same to this day, a small house, with a porch and screen door that creaks like Summertime and crickets when you open it! I was a VERY shy child. Once inside the library, my Mother went to get a book from another room, and I just stood in the hallway, not knowing which way to go. It felt like I was there a long time, but then the Magical Library Lady came to me, (Miss Eleanor Janeway) smiled, took my hand, and said "I think I know where you belong.") Of course, she knew my Mother, it was a small town. The next thing I know, I am in the Children's Room, at a low table painted white, and on the table is a handmade little bookshelf, with a whole set of little green hardbound books,...... all the 23 books by Beatrix Potter !! Oh, joy !! That was magical indeed. I wanted to take out ALL of them, that day. But Miss Eleanor explained that was the only set and other children would like to take them home to read too. So, I had to decide, which animals would I read about first ? That was very difficult. Usually, I was a very compliant child, but Beatrix Potter books?, I wanted them all! Finally, Miss E made an exception and let me take home three books at a time, instead of two, Mrs. Tiggy Winkle, Tale of Two Bad Mice and Squirrel Nutkin. That visit began a lifelong admiration for Beatrix Potter. It was a special day, because at age six, I was issued my very own library card. Years later, I met Jane Morse, at the Castine Library in Maine, when Jane hosted an event of The Beatrix Potter Society. I made two loaves of bread in the shape of Peter Rabbit, with raisins for eyes. It was the first time I ever made homemade bread, at age 28. I was delighted that Jane wrote me later that it made excellent toast the next morning at her B&B. I have had many Nanny positions over the years, and I always read Beatrix books to the children. The South Londonderry Library began in 1902. I hope they are still stamping the books with the blue ink stamper. I looked at photos of the library recently, and I do believe the same low white table and chairs are in the Children's Room! I had such an amazing experience in libraries that I became a librarian! I adored being surrounded by information and the librarians were always the perfect combination of helpful but never intrusive. I'm old enough that I remember when I graduated from the children's section to getting the coveted "adult" library card - WOW! So many more stacks to peruse. I live within walking distance of my public library and it is one of my favorite things about living here. I have to admit, though, that I am in love with their electronic catalog. No matter what time of the day of night, I can download a book or audiobook on my Kindle or tablet no matter where I am. It is truly magic---20 years ago, who would have imagined this technology would be out there? Oh no---I forgot to provide my contact info---my RavID is brenda0312.